F.R. 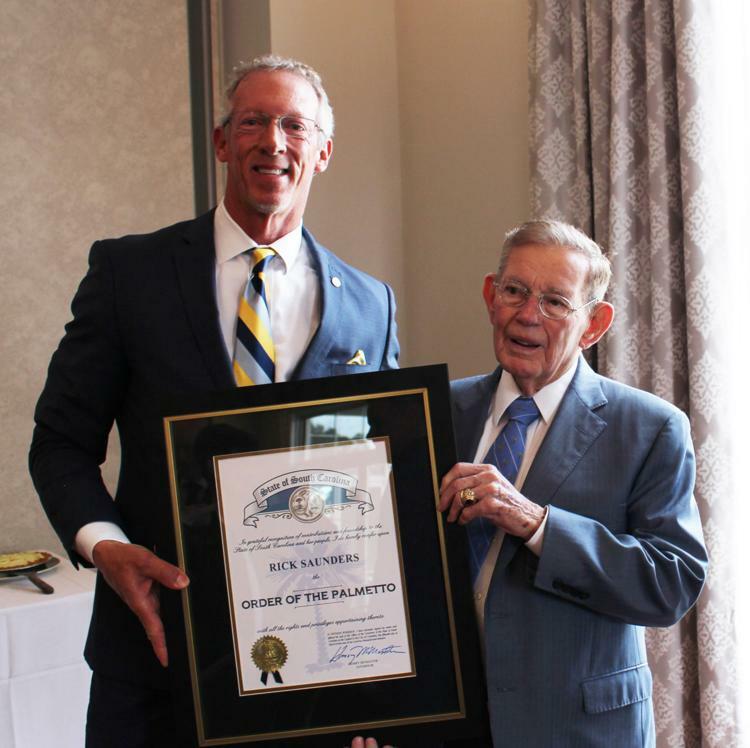 “Rick” Saunders was awarded The Order of the Palmetto — the highest civilian honor awarded to residents of South Carolina for extraordinary lifetime achievement, and for national or statewide service — by S.C. Sen. Hugh Leatherman during a luncheon Friday at Florence Country Club. Saunders was appointed by Gov. Mark Sanford to the South Carolina State Board of Financial Institutions, where he served a 12-year term. On the board, he led efforts to restructure the responsibilities of the State Banking Commission and worked closely with legislature to accomplish this. He also served on the State Chamber of Commerce Board and the South Carolina Bankers Association Board, both of which are state-focused organizations. Saunders has also served on more than a dozen other local and regional boards since the formation of First Reliance Bank in 1999. For his leadership and work, Saunders has been recognized for other past awards such as an Entrepreneur Award for his contributions to the prosperity of the Pee Dee Region by the Florence Darlington Technical College, Business Man of the Year by the Florence Chamber of Commerce, The Beta Gamma Sigma honoree from Francis Marion University School of Business and The Ernst and Young Entrepreneur of the Year national award for the financial industry.